Blocked out of the Seine by the Normans, the Vikings invaded Brittany and drove its nobles into exile. For most of the 9th century, Britanny escaped relatively lightly from Viking attacks; although it suffered its share of coastal raids, the region was peripheral to the Vikings' main interests. The worst attacks were probably in 847 and 888, when parts of Brittany were briefly occupied, but a series of Breton victories 888-91 won the region a 20-year respite. In many ways the Vikings were more of a help than a hinderance to the Bretons in this period. The Frankish emperors were too preoccupied with internal problems and Viking attacks to prevent the Bretons expanding to the south and west, and were obliged to recognize Brittany's independence. The Vikings proved useful allies; a joint Breton-Viking army attacked Le Mans in 865. But in the 10th century, the situation changed. The settlement of Rollo and his followers in Normandy in 911 closed the Seine to Viking raids, and in England the Danes were being pushed onto the defensive. Only Brittany and Ireland remained open to attack, and from 912 the raids intensified. Most coastal monasteries were abandoned as their terrified monks fled with their relics and manuscripts. 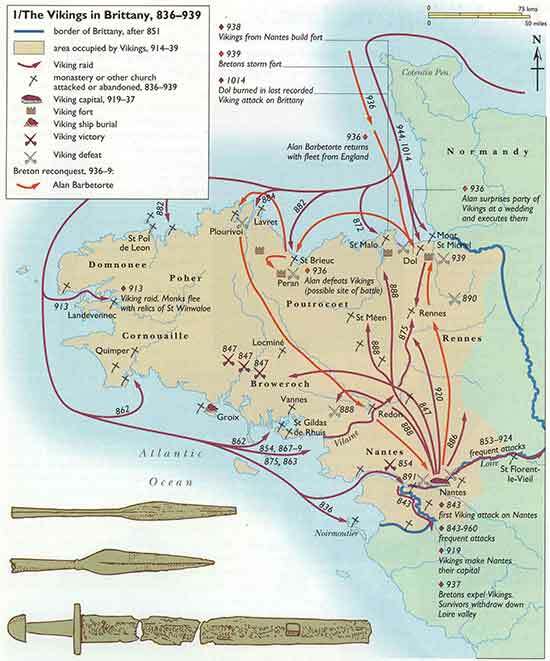 By 919 Brittany's defences had completely collapsed: the nobility fled to Francia and England, and the Vikings under Rognvald conquered the whole country, making their capital at Nantes. The conquest seems to have been a purely military takeover: there is no evidence of any settlement nor, apparently, did the Vikings engage in trade. Nantes, whose position at the mouth of the Loire should have enabled it to become a flourishing trade centre like York or Dublin, was semi-derelict when the Bretons recaptured it. In 931 the Vikings concentrated at Nantes to launch an invasion of Francia. The Bretons saw their chance and rebelled. Though the rebellion was put down the weakness of the Vikings' position was exposed. This encouraged Alan Barbetorte ("twisted-beard"), an exile in England, to lead an invasion of Brittany in 936. Nantes was retaken after a fierce battle in 937 and the last Vikings were expelled from their fort at Trans near Dol in 939. The effect of the Viking occupation was disastrous for Breton independence, however. The authority of the dukes never fully recovered, and by the 11th century Brittany had become a satellite of Normandy. The information on this web site is for your personal use only. All pages, compilations, transcriptions and abstracts are protected by copyright law and may not be copied in whole or in part and published or distributed in any manner without written consent of the author, contributor and/or webmaster. Copyright ©, The Power Et AL DNA and History Project. All Rights Reserved. Your comments & suggestions are always welcome.